Dedicated donors are clearing the path to connection. Many trailblazers contribute directly to specific sections of this ambitious project, and we’d like to share a few of their stories. 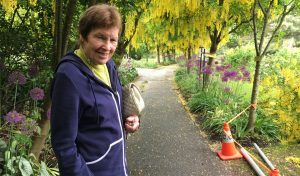 Sheila Ross at the Van Dusen Gardens, BC. For outdoor enthusiast Sheila Ross, it’s second nature to contribute to a cause that aligns with her appreciation of outdoor activity. Philanthropy is a way of life for Sheila, whose iconic Canadian family believed in giving back to the community. 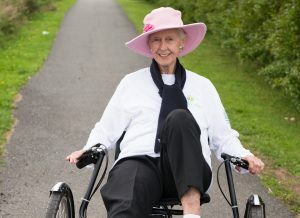 A long-time champion of Trans Canada Trail, she increased her giving in order to help achieve national connection in 2017. 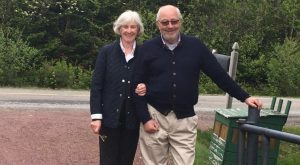 Sheila shared her enthusiasm for this great Canadian project with her late husband Bob, who was part of her Greyross Foundation. “It’s such a permanent thing,” says Sheila, who enjoys reading about the project’s progress. “So many things come and go, but not The Great Trail.” Today, Sheila continues to encourage others to appreciate our country’s expansive nature and history. Nancy Baron on the Confederation Trail, PEI. Nancy Baron fondly recalls an idyllic childhood in England with her family, where they enjoyed biking, paddling and strolling together in nature. Now a trustee with the W. Garfield Weston Foundation, Nancy’s support for the Trail stems from these early memories. Following a similar path in Canada, she continues to stay close to nature. Since 2013, her gifts have been directed to trail-building efforts in P.E.I. and Nova Scotia. “The Trail will give everyone a chance to stand and stare,” she once said, referencing a poem by William Henry Davies. Recently, her enthusiastic support proved instrumental in developing several trails in Nova Scotia, including the spectacular Ship Railway Trail and beautiful Bealach Brèagha Lake Ainslie trails. Sandra Crabtree and her husband Gerald MacGarvie. For more than 60 years, the Crabtree Foundation has contributed to a sea of change in support of Eastern Canada. Although based in Ottawa the Crabtree Foundation is proud to support The Great Trail in Nova Scotia as they spend a good part of every year in this stunning corner of Canada. Walking the talk, Crabtree family members often hike the Trail’s scenic New Brunswick stretch and they’re keen to see a national connection. They love their home by the Bay of Fundy in New Brunswick, making them ardent supporters of the entire East Coast.